The Highlead GK0058 is a high speed double-lock Chainstitch flat bed sewing machine available as either a single needle or twin needle model. It has a sewing speed of up to 5000 SPM and features an adjustable stitch length for use on a wide range of textiles and garments. The sewing head has an automatic oil lubrication system which reduces wear & tear and allows the machine to run smoothly at high speeds. 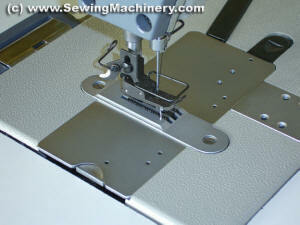 The double-lock chainstitch is formed using a needle bar thread take up mechanism combined with 1 or 2 lower loopers. 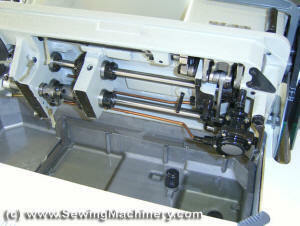 A stitch condense lever is also fitted to help secure the stitch. Men's shirts, trousers, ski pants, coats, & blazers, lap-seaming, Skirts etc. or where you need a single or twin needle double-lock chainstitch formation which is firm, elastic and decorative.